Butter is one of those foods that offends the “Paleo Police” – those who omit foods from their diet based solely on the logic, “Paleolithic man didn’t consume it.” Yes, from a purely evolutionary perspective, blah, blah, blah. We get it. But our perspective on food, while built on a solid “genetic heritage” foundation, isn’t really concerned with whether a make-believe Grok would have exhibited a certain behavior or eaten a certain food. And in the case of butter, we think Grok is (mostly) irrelevant. What we’re actually more concerned with is whether a particular food choice makes us more healthy or less healthy. And while we’re not encouraging everyone to eat more butter, we do consider ita bit of an outlier in the dairy category, which is why we’re exploring the subject here. Butter is the glorious, concentrated solid fat that is produced by churning cream. Though it can be made from the milk of sheep, goats, and even yaks – ew – most folks get their butter from cows. We know very few sane people who don’t enjoy the creamy texture and rich flavor of butter, even if they don’t “indulge” because they’re afraid of the saturated fat and cholesterol content. First point : The medical research community is (re)learning that saturated fat intake is not directly responsible for heart disease and stroke. No really, it doesn’t. This mythical correlation has, in fact, been disproved time and time again, and is discussed in great detail in the book Good Calories, Bad Calories by Gary Taubes. As such, this doesn’t factor into any thought process we may have about butter consumption. More specifically, we do not have any concerns with the fat content of butter. However, most people assume that butter is all fat. This would be an incorrect assumption. If you’ve read our Dairy Manifesto or any of Dr. Cordain’s dairy research, you already know that dairy proteins like casein and whey do some ugly things in your body, and contain growth factors and immune factors which negatively impact your health. These milk proteins contribute to conditions like cardiovascular disease, cancer and autoimmune diseases, and produce other inflammation-related symptoms (not the least of which is digestive distress). Exclusion of almost all dairy products (including regular old store-bought butter) is one component of our Whole30 program, and we recommend against consuming milk, cheese, yogurt, ice cream or whey protein even after your Whole30 is over. Still not convinced? Then let us also mention that it’s not just the milk proteins in butter that have us concerned. 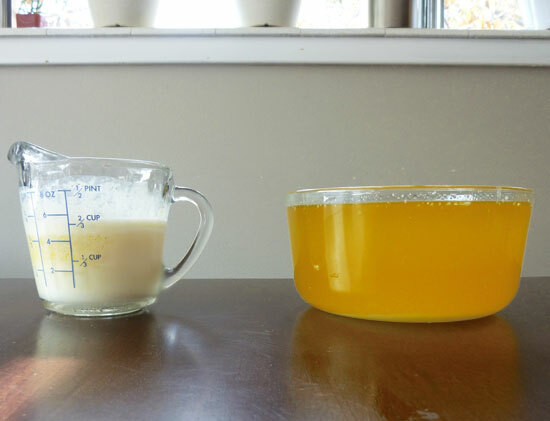 Two pounds of clarified butter yields almost 2/3 cup of milk solids. Third point: What dairy cows are fed, and the conditions under which they are raised, has a significant impact on your health. 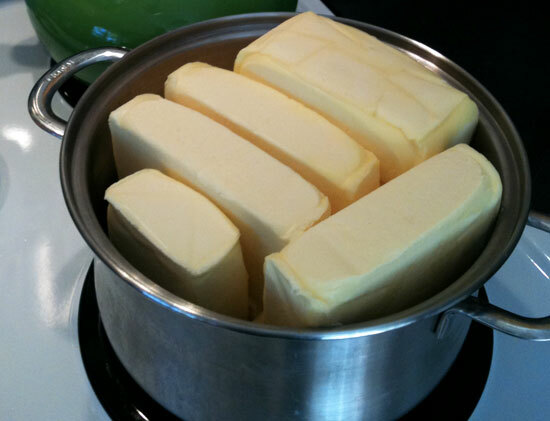 Unhealthy cows produce unhealthy butter. The horrific health of most dairy cattle in this country is another significant cause for concern. Commercial (factory farmed) dairy cattle are routinely given synthetic hormones and unnatural feed (including that soybeans, corn, wheat, barley, pork meat and bones, and bovine blood meal) and are treated in ways that could easily be classified as torture. They are also routinely exposed to heavy metals, pesticides and other environmental toxins. In addition, feeding creatures an unnatural diet makes them sick and miserable (have you seen “SuperSize Me”? ), and most eventually require medical treatment, including antibiotics. Some of these things – hormones, antibiotics, environmental toxins – are fat soluble. Which means they make their way into the dairy products that come from these animals, and make their way into you when you eat them. That doesn’t sound very healthy to us. As all of the butter you’ll find in a typical supermarket (and most of the butter in your local health food store) includes those problematic milk solids and come from the factory farming system, we can’t recommend commercially produced butter as a part of your healthy diet. However, despite the long list of negatives associated with your typical grocery store butter… all is not lost. Fourth point: We do have a set of criteria that makes butter a good food choice, even during your Whole30. But we can’t justify consumption without making some significant efforts to improve the quality of the butter and remove the milk solids. Grass-fed or “pastured”. The cows must be grass-fed, or “pastured”, indicating that they are not raised primarily on unnatural diets. This is perhaps the biggest contributing factor to the overall health of the cow, and the milk it produces. These cows live outside, are free to roam, and are treated humanely, unlike their factory “farmed” counterparts. Healthy, happy cows living in their natural environment produce healthier butter. Organic. The cows must not be given hormones or antibiotics, or be exposed to synthetic pesticides and other banned substances. While the “organic” label is sometimes manipulated to increase profits, in this instance, it actually means something with respect to the cow’s health and treatment. None of that junk in the cow’s environment means none can make their way into your butter. In summary, the only way we can recommend eating butter is if it comes from a humanely raised, grass-fed, organic source, and you take the time to clarify it. There are no major down sides to butter produced in such a manner, and we can happily recommend you use your clarified butter or ghee as one of your (varied) added fat sources. Fifth point: Fat from clarified butter is very stable, and can be kept for long periods of time without going rancid (unlike fragile seed oils). This also makes it a good choice for cooking. Your best bet for finding high quality butter is to check our your local health food store, or Whole Foods. We use Organic Valley’s Pasture Butter, and they’ve got a great tool on their web site to help you find a farmer in your area. Pastured butter in the U.S. is seasonal, so when you find it, buy it in bulk and freeze it until you are able to clarify it. Clarified butter can be kept in the refrigerator for months at a time – not that it usually lasts that long at our house. However, clarified butter is highly susceptible to picking up odors and flavors from other foods (especially when warm), so be sure to store it in a something impervious like a glass jar with a tight-fitting lid. 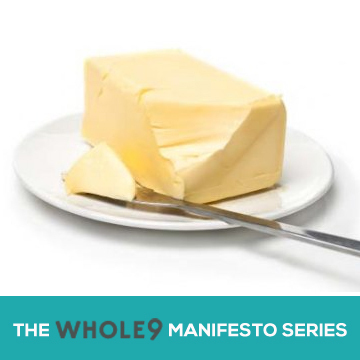 Have questions or concerns, or simply want to share whoops of joy that you can once again indulge in the glorious, rich flavor of butter during your Whole30 program? Drop it in comments. Daphne, seems like that olive oil butter is just a sales/marketing pitch to reduce the saturated fat content of butter. I’ll stick with EVOO and use my pastured, organic butter, thank you. Awesome post! “The Butter Manifesto” is my favourite title for anything… ever…. I’m a bit confused with the ‘organic dairy’ thing. As I understand it, certified organic dairy farms gain ‘most’ of their certification on the fact that they feed (if only partially) their cows with ‘organic fodder’ which of course, is going to contain ‘organic’ grain and often other animal products). Can anyone clarify? As a result, I would be disinclined to trust the tag ‘organic’ over ‘grass-fed’ when it comes to meat or dairy – but I do (generally) trust it when it comes to vegetables etc. We live in an area with lots of Walmarts and Krogers. There is only one place that sells natural and organic food and it’s 45 min away! They sell Organic Valley Cultured Butter, not their pasture butter. Is that particular variety still suitable for Whole 30 purposes if we clarify it? Rachel, to be clear, you can use ANY butter for the Whole30, as long as you clarify it first. We simply recommend pastured, organic butter to start with, because it’s healthier for you and the animals. However, pastured/organic is not a rule of the Whole30. I have a question, and please forgive me if it sounds stupid! LOL I’m VERY new to the Whole30 movement, so I’m wondering about the video showing how to clarify butter. At the end of the video, she shows the container full of the clarified butter and it’s solid….does that happen in the fridge or should I freeze the butter after to make it solid? Can you freeze the butter after it’s clarified if you aren’t going to use it for awhile? I only have a few locations close to me that sell the Organic Valley pasture butter, so I’m thinking of stocking up and then clarifying and freezing, but I’m unsure if that will mess it up. I hope at least some of that made sense! Sorry to ramble! These are good questions. First, the butter gets firm in the fridge, just like normal butter. It behaves just the same–leave it out in a normally heated (68 degree) house and it gets soft, put it in the fridge and it gets hard. You can absolutely freeze butter and then pull it out to clarify it in batches as you start to run out. We do that all the time–pastured butter is seasonal, so we buy a ton, freeze it, and pull out a few pounds at a time to clarify as needed. I appreciate this very much. Very informative. Quick question, I’m traveling (central america) and don’t have access to quality butter. Is using commercial grade butter ok to use for making ghee? Better to have no ghee rather then use commercial butter made ghee? Ben, if you can’t find pastured/organic butter during your travels, that’s okay. You won’t be getting all of the nutritional benefits of grass-fed dairy, but you can still take that butter and clarify it for your Whole30, and it’s still a good source of dietary fat and a one of the best fats for cooking.